Below I've collected tips from readers, and from around the web with ideas for how to organize kids' artwork, even if you've got mountains of it. The key I've gleaned from these tips, as a whole, is that it is so much easier to deal with the artwork as it is created than to try to deal with it later. Then, you can properly label some of it, or otherwise document which child drew or colored it, or made the craft project, when they did it, and how old they were when the did it. Further, kids when learning how to create, don't just make one or two masterpieces. Instead, they make LOTS of stuff, some of it pretty darn amazing and some of it junk. There is nothing wrong with this, or abnormal. Kids are learning about the process of creating, and not everything will look amazing. But practically, you just can't keep everything they ever make. There is not enough room. Instead, you've got to cull, toss, and declutter their artwork. Again, this is easier to do as you go along than to try to do it all years later, when you've got lots. However, whether you do it a little at a time, or in one fell swoop after 10 years of accumulation the basic principles of the organization process are the same. So, without further ado, here are tips and ideas I've gotten from readers with their suggestions, and also that I've found throughout the web on this subject. Join in and write your own page! It's easy to do. How? 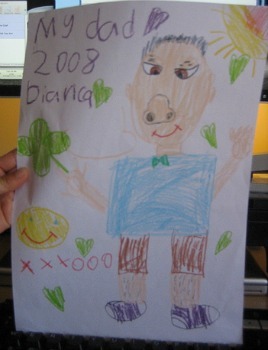 Simply click here to return to Kids' School Papers & Artwork. Take A Photo & Preserve More Than The Memorabilia! 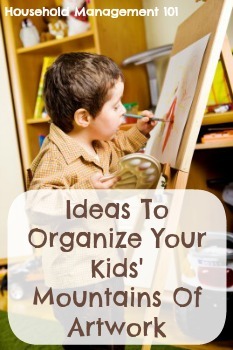 Krista shared her tip on how to organize kids artwork. I like to take a picture of my daughter holding the artwork she has created, drawn or painted, etc. This perserves the artwork and the age at which my child created it. I also have several children, and ofter fail to label artwork, so this method ends the confusion over who created the artwork and at what age. Taking a picture also really makes children feel proud. My daughter feels that the artwork is so special to me that I want a photo of her holding it. I often also take a close-up of the artwork alone. I plan to add these photos to a digital picture frame so she feels honored each time her artwork is on display. Another added benefit to a digital photo is that it allows you to dispose of some creations when needed and it preserves all artwork in case of a disaster such as a flood or fire. Thanks so much for these great ideas and tips Krista! I love taking pictures of my kids' artwork too. It does make them feel special, and preserves such special memories. We all know we can't save every piece of paper our kids scribble on, or we would soon get buried under it all. But, it is nice to save some special pictures, notes, and school papers from various stages of their lives, for sweet memories later. I really liked the idea that Nan from Mom's The Word had about creating childhood memory boxes for each of her children. What I really liked about her idea was that it didn't need to be an elaborate way to organize and save every paper. Instead, she just saved some of the really special ones. She also didn't just save the A+ papers, but some of the lower grades, to show her kids how they stretched and grew. Finally, this is the type of idea where you can just jump in and start saving. You don't have to worry about the fact that you missed saving stuff from all of second grade, but can just start now saving stuff in this grade. 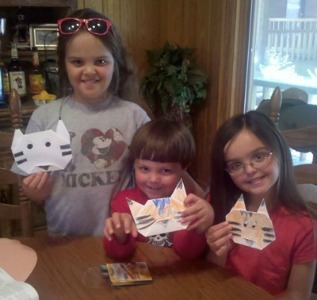 Teresa shared how she organizes her children's art projects in her home. I have 2 children, 1 in pre-school and 1 in kindergarten. The only available space I have in my kitchen is the side of the refrigerator. I hang up all of their art work everyday for a week. Then I throw it out and start fresh the next week. If there is something special I want to save forever, I don't throw that out but put it in a folder, labeled with their name and grade. At the end of the year I'll put the folder in my memory box stored under my bed. A few things that are special and that they're very proud of I'll hang on their bedroom wall. I usually throw out the artwork on the refrigerator when they're not looking. If they see it in the garbage I just tell them we can't save everything and I want to be able to hang up all the new things you make this week! They are OK with that once I explain. That sounds like a good system Teresa. Thanks so much for sharing it with me! Below is a video which echoes the sentiments of the reader above, and suggests taking pictures of your kids' artwork. The video also discusses how to organize all of your kids' school papers at the end of the school year. Clear out your kids' backpacks regularly (or encourage them to do it themselves when they are old enough). 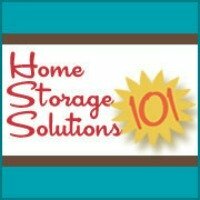 At the end of every school year it is important to take time to toss all the paperwork which is no longer needed, such as old school calendars, etc., so you don't keep lots of unnecessary stuff that takes up room in your home. In regard to artwork (and homework in general) you need to decide what your criteria is for what you keep, versus what you throw away. You will have to throw some stuff away or you will quickly get buried under an avalanche of paper. 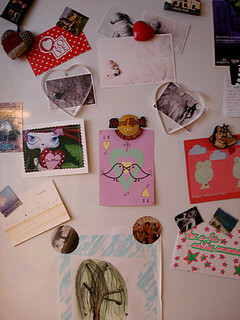 Allow your kids to help with throwing stuff away -- including their artwork. I think this is very important, because it is a great way to learn that we don't have to be packrats -- we can part with stuff without feeling that we aren't loved. You need a special way to save three-dimensional art that is separate from papers, because obviously 3D stuff can't fit in files. 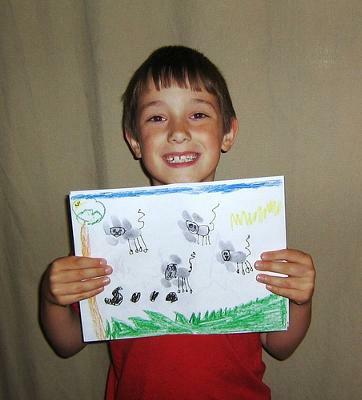 "I definitely take pictures of odd shaped artwork or scan it to keep even the coloring pages...It is a great efficient way to "keep" artwork for him in the future. I have it all filed by date for him on an external hard drive! it has worked great!" I keep one 12x12 box for each year.. if it fits it stays. We homeschool and I found out years ago I could get buried under 4 children's artwork pretty quick..lol So we started doing handy crafts rather than things like gluing beans to paper...their handy crafts are projects like knitting a scarf, weaving a coaster etc. (useful things) this keeps them occupied and less likely to use an entire tree's worth of paper in a week. They do each have their own sketch pad though where they can draw and then everything is contained in there. Scan them at the end of every month or take a photograph. Send them to shutterfly and make a book at the end of the year. Pitch originals when no one is watching, keep your favs. Artkive is an app that organizes kids artwork and then can send it off to make a book I love this all so much and it's free. This is a huge annoyance with me! I keep what the kids are proud of then the rest goes in the circular file. We keep them for about 6 months and the pictures get taken of the item and the owner holding it. Those go into a file on the laptop. The exceptions are clay projects and other special items. I take pieces of their art work and make large collages. I keep only things that have their creative personal touch, and I keep them in an expandable 12 pocket file...one pocket per grade. The size forces me to limit what I keep, and I also just take pictures of 3D objects that I then keep in the file. How to deal with kids creative artwork. If you have a smartphone you can use the Keepy app. This app is free. All you do is take a picture of the Artwork and you can use your or your child's voice on it. Saved Memories. I have 3 kids - Preschool, 2nd and 4th grade - they do a lot of art work, crafty assignments, etc at work, but also love to draw and color at home. After school every June, we host a Family Art Night and invite the grandparents over for dinner. Each child has a wall to hang up their art work that is for sale. I give the grandparents gold coins to purchase, and they will haggle with the kids for pieces they want. I do mark a few NOT FOR SALE for me to keep. The kids love that sometimes grandparents will fight over something. This way, grandparents only get a few things they want, I keep a few things I want, and we toss everything else -BUT - everyone has seen or shared everything they did. I frame some of them and hang them up! My husband and I discovered a perfect resort along the coast of Lake Michigan. Very family friendly, anď three hot meals and cookies and milk at 9Pm, good plain meals expertly cooked. When we went the first time I was about six months pregnant. One day I had a great idea. We had already decided that we would come every August. So we sat on the bench in front of the pretty sign with the graphic logo for the resort. My idea was to have our picture taken at the same place every year. It is wonderful to look at the pictures and see our family grow from two to four year by year. This is not on point for decluttering kids art work but I thought it was a good idea that I wanted to share. I constructed a nifty way to collect art work. I used 2 large poster boards, and duct taped 3 sides. One the opening I made a duct tape handle. We put our favorite art pieces in each child's xxl folder and store them behind their dresser in their rooms. Easy peasy, and saves space too. Use their artwork to decorate their room, your room, family or play rooms. Inexpensive frames can allow changing pictures at will.